At the far end of Horseshoe Bay is the trail that connects to the other beaches. This is a sandy trail that meanders around and over hillocks, rises and dunes. 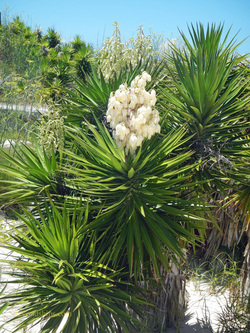 It is surrounded by scrub vegetation, some of which flowers. From time to time, there are side trails that leading to vistas of rocky shore line and/or small mini-beaches. By now, you see very few people. One of my ancestors was shipwrecked on Bermuda in 1609. The island was uninhabited at that time. Walking along the isolated trail, I could not help but wonder whether this was what it was like for him and of his reaction to the natural wonders that he would have encountered, which were so different than his birthplace in Hampshire, England. The first beach that you come to after Horseshoe Bay is Chaplin's Bay Beach. This is a much smaller beach than Horseshoe. However, it is also much less populated. The beach features a carpet of pink sand leading down to the turquoise sea. On either side are vertical rock walls, which give it a secluded feel. Offshore, there are submerged rock formations that are clearly visible through the crystal clear water. It is a romantic spot that is often used for wedding ceremonies. Not far, but hidden, from the beach is a car park that also has rest room facilities. These facilities are convenient to the next beach as well. The neighboring beach is Stonehole Bay. This is in many ways similar to Chaplin's Bay – secluded, pink sand, and surrounded by towering rock formations. However, nearly the entire beach disappears at high tide. Also, while the water near shore is usually calm and shallow, you have to be careful the further out you go because of rough seas and rip tides. All along this stretch of shoreline, the limestone rock has been pushed upward so that its strata, originally horizontal, now often point toward the sky. Furthermore, centuries of being pounded by the waves and the wind has carved them into unusual shapes, fascinating to see. For me, the prettiest of the South Shore beaches is Jobson's Cove. A tiny pool surrounded almost entirely by towering rocks, the water here is calm and clear. There is only a small stretch of pink sand beach fronting the pool so it can become crowded with relatively few people. Still, its striking resemblance to a set designer's vision of a tropical paradise is a strong lure.